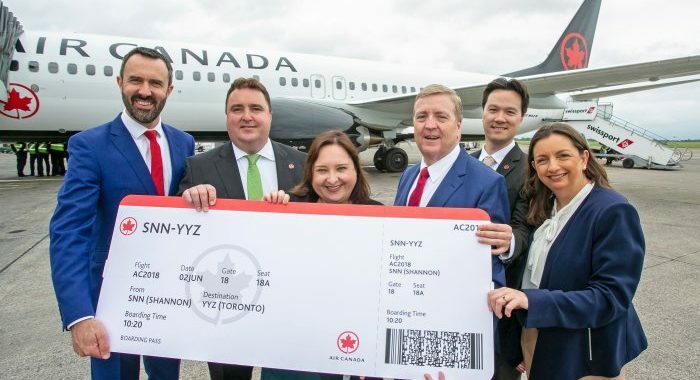 SHANNON, 3 June 2018 – Air Canada inaugurated its non-stop seasonal service between Shannon and its Toronto hub, Toronto Pearson International Airport on Saturday 2 June with a celebration at Shannon Airport. The new route will be operated by Air Canada’s newest single-aisle aircraft, the Boeing 737 MAX 8, with four flights per week until 13 October 2018. Marking the occasion, the first inbound flight from Toronto was welcomed to Shannon Airport with a water cannon salute whilst customers, guests, Air Canada employees and crew joined Jackie Ellis, General Relations Officer at the Embassy of Canada, Pat Breen, Minister of State for Trade, Employment, Business, EU Digital Single Market and Data Protection, Kevin O’Connor, Air Canada Vice President System Operations Control, Bláithín O’Donnell, Air Canada Sales Manager Ireland and Andrew Murphy, Shannon Airport Managing Director, before the departure of flight AC821 to Toronto for a special gate celebration featuring swing and lounge music from entertainer Liam O’Brien. The Boeing 737 MAX 8 operating the new Shannon-Toronto service features a two-cabin configuration, with 16 Premium Economy seats in the front cabin and 153 Economy seats – including 54 Preferred seats with additional legroom – in the rear cabin. Air Canada has 61 firm orders for the 737 MAX. They are to be delivered by 2021, with 18 due to enter the fleet by the end of 2018. The Boeing 737 MAX brings advanced engine technologies to build on the strengths of the Next-Generation 737. The 737 MAX incorporates the latest-technology CFM International LEAP-1B engines to deliver high efficiency, reliability and passenger comfort in the single-aisle market. Air Canada Premium Economy offers seating with generous personal space, a greater recline and a next generation entertainment system featuring a personal touch-screen TV. Additional benefits include premium meals accompanied by complimentary wine and spirits, a generous baggage allowance – two checked bags up to 23kg each – as well as priority check-in, boarding and baggage handling. Air Canada International Economy offers seating with adjustable, foldable headrests for a better sleeping position, in-seat power, a USB port, a complimentary hot meal accompanied by a selection of wines and spirits and a personal touch-screen TV with hundreds of hours of top-rated entertainment. Air Canada offers the best market coverage of any carrier between Ireland and Canada. In addition to its new non-stop seasonal service from Shannon to Toronto, Air Canada operates a year-round non-stop service from Dublin to Toronto and a seasonal non-stop service from Dublin to Montréal. Air Canada Rouge – Air Canada’s leisure carrier – also operates a seasonal non-stop service from Dublin to Vancouver. All flights are conveniently timed to connect at Air Canada’s hubs with an extensive network of services to destinations throughout the Americas. For more information and to book flights visit www.aircanada.com or call Reservations on 00 800 6699 2222. Shannon Airport is Ireland’s second-largest long-haul airport and the only one on the Irish western seaboard with direct services to/from North America, UK and Europe, giving international markets access into a catchment region that includes three of the country’s largest cities and major hubs of foreign direct investment – Cork (1hr 40mins), Limerick (25mins), Galway (60mins). It is just 2hrs 30mins from the capital, Dublin. From a tourism perspective, it is also the gateway to the world famous Wild Atlantic Way – a breathtaking, 2,500km coast road that offers some of the world’s most captivating scenery as well as the unique Irish culture and warm welcome.